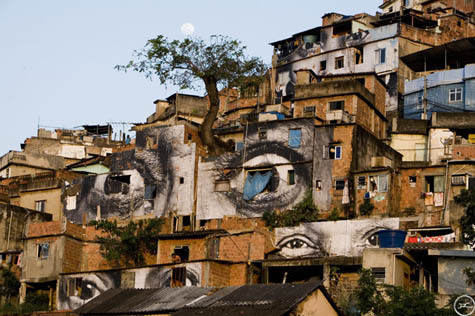 [Image: An installation of work by photographer JR on the walls of a Rio favela]. "Undercover photographer" JR – who makes "photo galleries out of our streets" by exhibiting his work in public, as posters – has taken his exhibition strategy a step further. "What is at stake here," he writes, referring to this change in tactic, "is the assessment of the possibilities of intervention in different environments." Amongst these environments are the favelas of Rio de Janeiro – however, here, these "possibilities of intervention" clearly include more opportunities for his work to gain greater exposure. [Image: Work by JR in Rio]. I have a variety of reactions to this. My first thought upon seeing these photos was actually that it was quite an interesting visual transformation of the favela. The realization that the Cubist surfaces of a mountain subcity might be transformed, through fragmentary glimpses of representational art – these shard-like pieces of larger works that only add up from certain angles, as if in parallax – seems to be a discovery worth taking further. However, at least two problems open up here: are you visually transforming the ghetto so that those who live in the city below no longer have to look up and see themselves surrounded by blight? They will see, instead, a hot new contemporary artist on display? Or could you visually augment the favela in a way that positively impacts both the self-image of, and the quality of life for, the people living there while not erasing the presence of that ghetto from the visual awareness of the central city dwellers? Perhaps there could even be something that looks, I might say, just as bad from the outside, but that nonetheless benefits the people living within. So the question is: who is this art really for? Because there's actually a third player involved in all of this: the international art market, where these sorts of guerrilla exhibition strategies now increase one's chances of canonization (and coverage on blogs). Less critically, though, I'm also curious here about the use of representational art. So often we've seen the walls of favelas repainted with primary colors and such like, in an attempt to beautify or, to be more sinister about it, visually correct an otherwise offensive built environment. 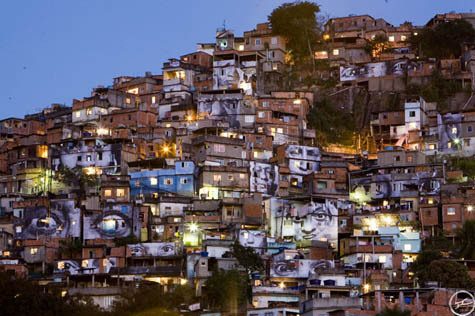 However, using the faceted hillsides of a favela as a kind of gemlike canvas for representational art actually seems to open up more interesting possibilities. Could you paint, or glue a poster of, all 200,000+ frames from a new film onto the surfaces of distant buildings? And treat the city as a kind of cinematic installation, a cubist filmography in which walking around is a form of experiential editing? You could live inside a fight scene, or in the closing credits. Or perhaps you could hike to the top of Buena Vista Park here in San Francisco and look out toward the high-rises of downtown – and see a photograph, installed anamorphically across the rooftops of different buildings, only correctly visible from this precise location (but what if that photo... is a Coke ad?). Perhaps the future of Cubism is not in some painter's studio somewhere but in the ten million unexplored, minor surfaces of the city. I'm reminded here of the (admittedly abstract) work of Felice Varini – and wondering what he might do, given a hillside with ten thousand surfaces all visible from multiple angles. Finally, though, there are the eyes: in these images, you are being looked at in return. But who is meant to identify with this? Are these the eyes of the favela dwellers looking out upon a city they cannot access, as if to shame those more privileged residents? Or, as the poor wander home at night up steep streets, are these the eyes of the world looking down at them in judgmental scrutiny? Again, though, there is a third class of people involved here. Perhaps these eyes aren't looking at the favela at all, and they aren't looking down at the city below. They are looking out at the international art market, hoping for coverage in magazines and blogs, looking for their real, intended audience: the people who will see these photographs, at home, around the world. The city is merely their blank wall and host. Cheers on the post. Speaking personally, the reason I did graffiti was because I wanted attention on my own terms. I wasn't trying to draw attention to social conditions, or modern urban dynamics- I did it for myself, full stop. Can't speak for what this guy thinks he's doing, but I have the feeling that you've probably got this guy pegged. Selfishness on a grand scale is still selfishness. "However, using the faceted hillsides of a favela as a kind of gemlike canvas for representational art actually seems to open up more interesting possibilities." There was a project in circa 2002 in Puerto Rico where an artist (Chemi Rosado Seijo) got an entire community to paint their houses various tones of green. It turned out pretty well and well-received, I think. Exhibited quite a bit. Just because someone comes up with an interesting enough idea that it's worth covering beyond the city itself does not necessarily mean one's intentions are for international fame and fortune - while some may be, but this could have easily have been a coke advertisement, the key is that it isn't. Instead it's the portraiture of the residents behind the walls. This project has been around for a while, sure the artist has a book now, but should we tell anyone who's ideas which meet a larger audience and tries to connect with that audience that they are only interested in getting their name published? Or are they genuinely interested in the work? I would submit it's the work, it cannot be easy to get a community to en mass install portraits across their already geographically undulating neighborhood, survey the canvases print them, etc. Should we say that a certain blog author is only in search of notoriety and sales of his soon to be published book? No, it is evident that it is the desire to work which drives said author! If blog author derives gain and more widespread coverage because the ideas and text are well founded, enticing and imaginative, such that they're spread is a worthwhile experience to others - such the better. Further inspection of the project in Rio reveals most of the images are those of women, perhaps from the neighborhood, offering an even further layer of meaning or commentary in their silent eyes. Just because you might become well known for doing something is not a reason to not get well known for doing something. That said, I think intention is the last on the list of things one can tell from art. Not that you might not be right--but I wonder what they people who live in the houses think. Were they paid? Or was it amazing for them to get to say "I live in the giant left eye house"? How does it feel to peer out of that giant pupil every day, and know the whole city is looking back at you? 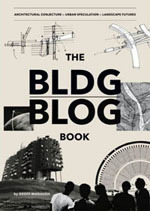 The life-span of a blog post or an art book is short--but now somebody lives in that house, every day. Or is a slum only a canvas? Ghettos exist for our interpretation (on a blog) only? The projects can be subject to critique as art, without reference to the artist's stated intent, just as the "work" and or "event." The projects also can be subject to critique as social commentary. In this case the artist has presented them in conjunction with social/political commentary on an internet site for the work. The project further raises some of the issues about architecture that are raised by graffiti. Posting on the BLDG blog blog invites this area of discussion. These aspects of potential critique may naturally overlap or can be overlaid experimentally. The complexity of the critique or potential for critique suggests that the project is at least an effective "intervention," creating another layer of event, another situation which has both a political and an art precedent especially in French modern art. This critique also talk about money making and context : social and economic　injustices. Talking about injustices is one step, tring to resolve and denounce them is an other step. Where do all the money created by this "contectual art intervention" goes? Where do this money have to go? or where do this money can eventually go in order that this intervention don t deny the context? It's quite possible that it may be "Rocinha" in Rio de Janeiro. Favelas are becoming a kind of simulacrum, that are used for artists, architects and poets, to drawn their thoughts. It´s allwright, bur favelas are bad environments. They are violent TOO, because of the space they provide: no sun, no play, no privacy. Given elaboration on the JR website, one possible interpretation of the work is as continuation of, or parody of, the projects of the Marxist Situationist International group. JR claims the work has something to do with the plight of women in conditions of war and poverty. The web site suggests participation by residents and victims. 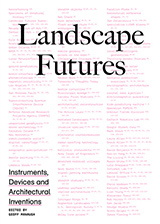 It may be useful to consider the projects in light of Guy Debord's, Report on the Construction of Situations:"Our central idea is the construction of situations, that is to say, the concrete construction of momentary ambiences of life and their transformation into a superior passional quality";and Simon Sandler, "The Situationist City." I suggest that, as with any work of art, critique requires viewing of the work itself or, at least, reliance on accounts of those who have seen the work or event. Discussion of the web accounts and reactions to web presentations is another realm. A separate set of issues: the consideration of relationships between the representation of space in art and in architecture. Robin Evans had some critical things to say on the latter in "Translations from Drawing to Building." I think BLDG blog raises pertinent issues with reference to Felice Varini and anamorphic perspective. The JR photos are nearly orthographic projections. Previous JR projects – photographs of French ghetto residents pasted on their tower blocks, portraits of Palestinian and Israeli residents pasted either side of the dividing wall, etc. 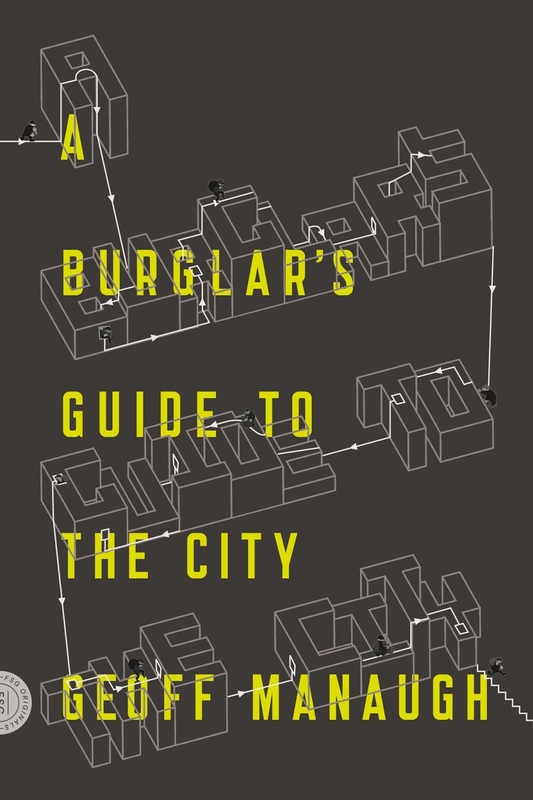 – seem to make a similar, and perhaps pertinent point: that a city's identity is made up of more than its architecture. Thanks for sharing this about JR, and also for everyone's rich commentary. I've posted a longer response over at http://immanence.blog.uvm.edu, the gist of which is that JR's photography is an instance of a growing globalism among artists, some of whom are first world liberals, but an increasing number of whom are of third world or ghetto origins, upwardly-mobile but nevertheless broadening the audience for art, film, and music. The question this kind of work leaves me with is: Is there something shared emerging between the gaze of those viewing the art (directly or mediated by the internet and/or art world) and those portrayed in it? What's the potential for that to happen? I think with JR there is more of it, partly because he's black (Franco-Tunisian), than, say, with Matt Harding of the famous "Happy people dancing on Earth" video. But these kinds of interactions will only increase as the world becomes more digitally mediated, so the ethical questions they raise will have to get thought through in all their permutations. Thanks, Geoff, for raising them. I have seen another work by this artist, it's a similar idea but the photos are printed on waterproofing material, and are attached to the roofs of the buildings. Although the above work maybe more visually striking, I prefered the other work as it not only looks great but also helps the people living in the buildings. I hesitate to call anything on such a grand public scale selfish. Even if the person has crass motivations, it is something shared with such a huge amount of people. I think a lot of people want to be famous just so they will be listened to - maybe that's ok when they have something interesting to say? If we can ascribe a function to art today, it is one that can generate some sort of awareness, another "gaze". Of course we all want any project, art or otherwise, to be ethically inscribed in a larger project of social change, but our individual powers are limited and we should each contribute with what we can offer. JR's project, to me, is partly about throwing the gaze back at us, and questioning the way we look at favelas, and poverty in general, as 'part of the landscape'. By activating the counter-gaze with the means he has at hand which are photography as urban intervention, this is already causing a change in perception, even if it is ephemeral in nature. It is a sort of 'appropriation' of a surface, a surface that is already charged with its own symbols and meanings and taking (good) advantage of the visibility of that immense canvas to bring to light a symbolic relationship with the images as they are positioned. Yes, it could have been a coke ad, but if it were a coke ad we would all be enraged at how big corporations and the media are 'privatizing' public space and about how the media is out-of-control-evil and oh-there-are-no-limits-to-the-media. With advertising, the issue becomes one of exploitation of those people and of those façades. The heated debate generated, especially in Brazil where a law has been passed in neighboring São Paulo in 2007 against 'visual' pollution in the form of ad billboards, would definitely not escape public opinion and would definitely fall into the politics of private commodification of the favela "surfaces". The beauty of art, if we can elevate a contemporary definition of beauty to something beyond the mere contemplation of the 'sublime', is that it has a permission to 'occupy space' for a so-called noble cause, and not do so in the interests of a corporation which would then urge to jump to our guns in protest. So what if the artist gains great visibility? What real social change does art caged in a museum actually cause? Art in the museum can, at best, stand as tokens of representation of ulterior realities, but they dialogue with 'empty space' and sometimes among themselves and consequently with the 'institution' of museums as the cathedrals of "good" sanctioned art. Contemporary art is as much about questioning these stale representations and the art-corporation as they are about being inserted in the fabric of everyday lived experience thankfully outside the museum (and this is not a new idea). The whole movement of Land Art and site-specificity was exactly this notion that art also needs to relate to something that is not itself, that famous "otherness" so often referred to in the theoretical circles, in this case engaging in a dialogue with existing architecture already charged with its own meanings, and yes, the guilt, horror, pity that the sight of a favela generates. The counter-gazing works because it specifically draws attention to something that we do not want to face, to a place where we would never go, towards people who are, to the eyes of the well-to-do, statistics of social blight. Everytime poverty comes into the mixture, so does the term 'exploitation' or 'denial'. I think this artistic intervention doesn't exploit nor deny, it uses the shacks as a surface for activating social and visual participation - a more current way of both practicing and viewing and discoursing about art. But JR's move is by no means isolated in history, culture or context. Wasn't it precisely in the favelas that the consecrated Brazilian artist Helio Oiticica had his great revelations about fusing art with life? Wasn't it exactly with the expression of samba and the cubist organicity of the favela that provided him with the perfect 'concrete' environment to his performatic wearable ritual mantles (parangolés)? This work is not isolated as an urban intervention in Rio either. For many years, and I am a witness of that, there have been many artist initiatives to occupy urban space (whereas in many other places in the world this is not necessarily done in such a scale) and treating the city as a place of artistic discourse, albeit ephemerally. Even politicians have constantly wished to intervene aesthetically in the favelas by painting the houses green as to camouflage the shacks into nature (naturally received by public opinion as a bad joke) or painting them white to resemble Greek coastal villages, or even painting them in several colors so as to raise the self-esteem of local communities. Rio citizens heavily criticize this kind of demagogy as "make-up" public works that seems to push the dirt under the carpet. Point taken. But in some cases, this surface treatment may very well begin to raise the self-esteem of the community and generate a well-being that begins to create an 'order' that may very well unfold into other less visual yet tangible results in the long-run. But JR is not a politician, he is an artist and his project has to be viewed as art first and politics later. I enjoy JR's intervention because it is a bold move to change perception in many levels, and it necessarily comes with an 'author' - why not? The author in this case means that the artist has control over his project, outcome and reception. To involve a team of collaborators and 'sign' a work of art as an author (or better, as the proponent) is older than Michelangelo or Giotto, you name it. The interesting part is to offer this as a site-specific proposition in which the image (and not just any image) is inscribed on the landscape and who knows if the favela dwellers themselves might not develop the proposition into further to include its own images, its own counter-gaze? JR's work is definitely different in the sense that he has actually negotiated with the community to put up his works, and is not necessarily as guerrilla as we may think. To execute such a project necessarily includes, in terms of coherence and yes ethics, that such a component be taken into account. Otherwise, how? With these images before us as we drive past them we open our eyes wide shut. I enjoy JR's intervention because it is a bold move to change perception in many levels, and it necessarily comes with an 'author'. His work is not isolated as an urban intervention in Rio either. For many years, and I am a witness of that, there have been many artist initiatives to occupy urban space (whereas in many other places in the world this is not necessarily done in such a scale) and treating the city, which is a character in itself, as a canvas. JR's work is definitely different in the sense that he has actually negotiated with the community to put up his works, and is not necessarily as guerrilla as we may think. To execute such a project necessarily includes, in terms of coherence and yes ethics, that such a component be taken into account. But while I applaud the initiative and like the 'counter-gaze' aspect, I can't help but think that the images he put up are not exactly the gaze of the people who live in that community, they don't feel like Brazilian joyful eyes (yes, even the poor people in Brazil have energy and time for a smile). They rather reminded me of surrealistic avant-garde gaze such as Bunuel and Dali's eye-opening scene in Le Chien Andalou. That scene has strong psychoanalytic undertones about the awakening of perception to other dimensions of the self. JR open 'stares' (for that is not really a gaze)rather seem to want to open the perception of the 'other', or maybe what he is doing is just holding up a mirror to ourselves. What? Photographs on favela houses? How can it be possible? With these images before us, we open up our eyes wide shut. One must insert himself in the current context of Brazil to understand that art better. Even the painter may not be aware that he was caught by the moment subconsciously. There is a sort of revival, recovery, of the favelas in Brazil by the current government which is represented by a former worker, i.e. he really represents the majority of people. This is not about appearances, but about education and training for that people. Inserting art in the favelas not only valuates the dwellers who should feel prouder, in tune with this 6 years government or so, but also catches the attention to a rather deceptive scene from the city, changing the mood public's rejection against it. Particularly I found it a lot bizarre, as well as the painter did the same with an icon of the city, the arcs of Lapa. But all this shows a change in Brazil's public conscience, in spite of the detractors. This is my view from Australia. Reminds me of the work of Felice Varini.